Welcome to the Scottish American Society of the Quad Cities! We're a community of people who come together to celebrate Scottish history, culture, and tradition, and our connections with our Celtic "cousins." If you're interested in Scottish and or Celtic history and tradition, you're more than welcome to join us! Events include traditional celebrations, such as our annual Robert Burns Dinner, Beltane, Tartan Day, Samhain, and St. Andrews Day, and we also support other groups that promote Scottish/Celtic traditions, heritage, and culture. You may find us at the Celtic Festival and Highland Games, hosting an annual Scottish Golf Day, or at Blackhawk Pipes and Drums performances. It is a great organization of friendly people, and we are always accepting new members. Scottish heritage or ancestry is not required. Please see our membership page, and do join us at an event. UPCOMING EVENTS: Be sure to check the "Events" page to check out details on upcoming events, including our Beltane party and potluck. 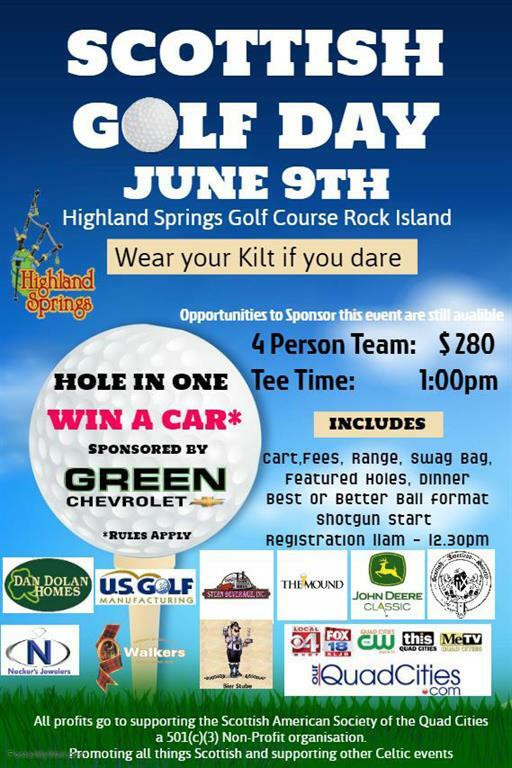 And make sure you catch our Scottish Golf Day on June 9! Are You in Pictures? Click on the "Gallery" tab at the left! Facebook Users: Check out and "Like" the "Celtic Newsbytes of the Quad Cities" page for interesting information on Celtic happenings in the QC area! Please fill out the "Contact Us" form to reach out to the Society. Ask questions on membership, general information, to send ideas, request information about an event, or any other reason. Our webmaster will either answer or forward to the appropriate Board Member or other person who can assist. Thanks! We look forward to hearing from you.